If you’ve been experiencing clogged drains or other problems indicative of a damaged sewer line, it might be time for a line repair or replacement. Call or text us at 605.222.4770 or use the request service form below for an assessment of the damage and to get more information about what to expect during the repair process. Regardless of the issue causing the problems you’re experiencing, we’ll get your sewer lines back in working order in no time. Furthermore, we never cut corners, so you can rest assured that the work we do will really last and your line will work properly for years to come. 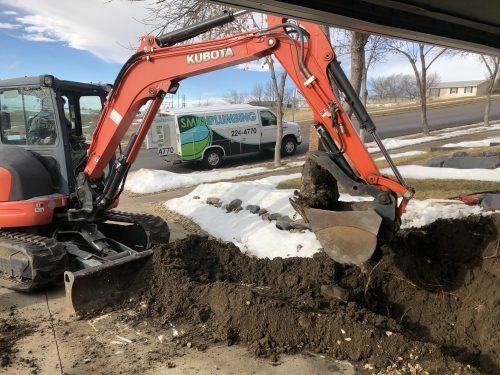 We’ll do everything we possibly can with our extensive realm of expertise to make repairs when we can, but sometimes a full sewer line replacement is simply a better option. This is a step usually reserved for pipes that have sustained significant damage or that have aged poorly and threaten to break. Replacements offer a bit more work on our end, but they’re sometimes the best way to ensure an issue you’ve been experiencing is really, truly fixed and not just covered with a temporary bandage. When a replacement becomes necessary, you can rest assured that our decades of experience and know-how will get you the quality you need quickly and with the touch of durability your sewer system needs to function properly in the coming years. You should never suffer from the effects of a poorly done sewer line installation, but more often than not that winds up being the case when you don’t work with the right team. At Smith Plumbing we believe in giving you the quality you deserve, which is why we’re here to right those wrongs with professional and thorough sewer line repair when you need it most. If you’ve been experiencing clogged drains or other problems indicative of a damaged sewer line, it might be time for a line repair or replacement. Contact us at 605.222.4770 for an assessment of the damage and to get more information about what to expect during the repair process.